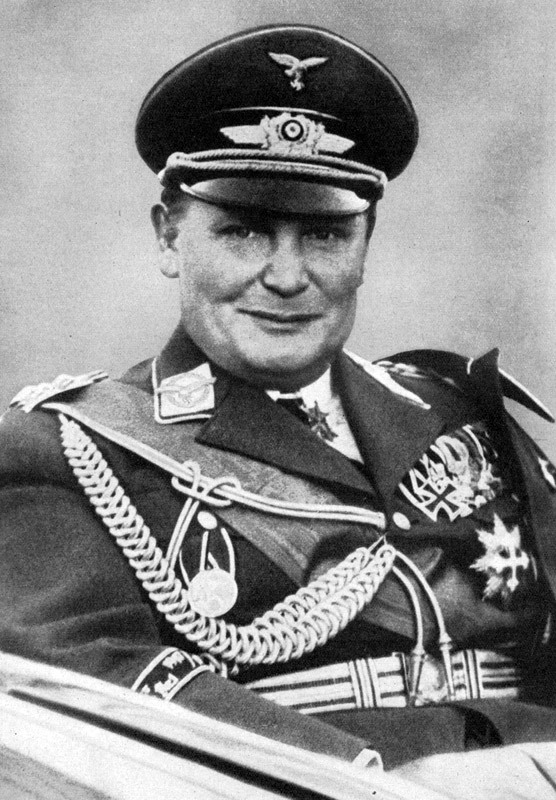 "The nearness of London to German airfields will lose them this war"
Hermann Göering began his a military career as a Lieutenant in the 112th Infantry Regiment. Ill health gave him the opportunity to transfer to the Army Air Service early in 1915. His skill as a fighter pilot gained him command of the Jagdgeschwader 1; Manfred von Richthofen's old unit. Late in 1922 he met Hitler, joined the National Socialist German Workers' (Nazi) Party and was given command of the SA Storm Troopers. After the Nazi's abortive coup in 1923 against the Bavarian State Government Göering fled abroad. The 1927 amnesty permitted Göering to return to his homeland and re-establish his ties with the Nazi party. When the Nazis came to power in 1933 Göering reaped the benefits of his loyalty to Hitler. So many honours and offices were bestowed upon him that his time was fatally divided between then all. In 1935 he was made Commander-in-Chief of the Luftwaffe but he lacked the technical knowledge and strategic forethought necessary to develop the German Air Force's full potential. The opening campaigns of the war were a great success but faced with the Royal Air Force the Luftwaffe's deficiencies in planning, logistics and a lack of clear strategic thought and application began to take effect. Not only did he overestimate the Luftwaffe's potential, he underestimated the strategic intelligence of his opposition. Perhaps his most fatal error was when he re-directed his forces to carry out massive bombing raids on towns and cities in August 1940. By shifting the focus away from the struggling airfields and fighter defences and onto the civilian front, he gave the RAF time to recover and refortify. This failure led to the RAF's victory in the Battle of Britain and the German abandonment of Operation Sealion. Even before the Battle of Britain had properly come to an end Göering was instructed to start planning operations in the Mediterranean and also against the USSR. Failing to knock Britain out of the war during the Battle left Germany with a war on two fronts once the attacks on the Soviet Union began. In May 1945 Göering was arrested by the Americans in Southern Germany and remained in their custody throughout the period of the Nuremburg trials, where he was convicted of crimes against humanity. Hours before his planned execution Göering committed suicide.